The Valdez Container Terminal Dock is a 700 ft. concrete floating dock, extending to 1,200 ft. with two dolphins. Water depth at mean low tide is 50 feet. The Container Dock is tied to a 21-acre marshalling yard by two 200-foot ramps. The dock is designed as a multipurpose berth to handle containerized, roll-on / roll-off and lift-on / lift-off operations. 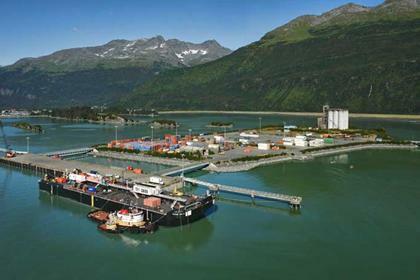 The Valdez Container Terminal has a 60-ton Fairbanks certification scale located at the entrance to the terminal. A grain terminal consisting of 9 concrete silos 112 feet tall and 33 feet in diameter with a total capacity of 522,000 bushels is also located on the Container Terminal grounds.